Open Your Legs, Darling or My First Time Skiing! I have always been a little bit terrified of skiing. I think it stems from my godmother having a wicked looking scar on her knee from a ski accident. When you combine that with news stories of celebrities (including a Dutch prince) dying or being seriously injured skiing which come every ski season, and skiing was on my top 10 never try list. However, when an opportunity came up to learn to ski in the Italian Alps, you know I jumped on it. 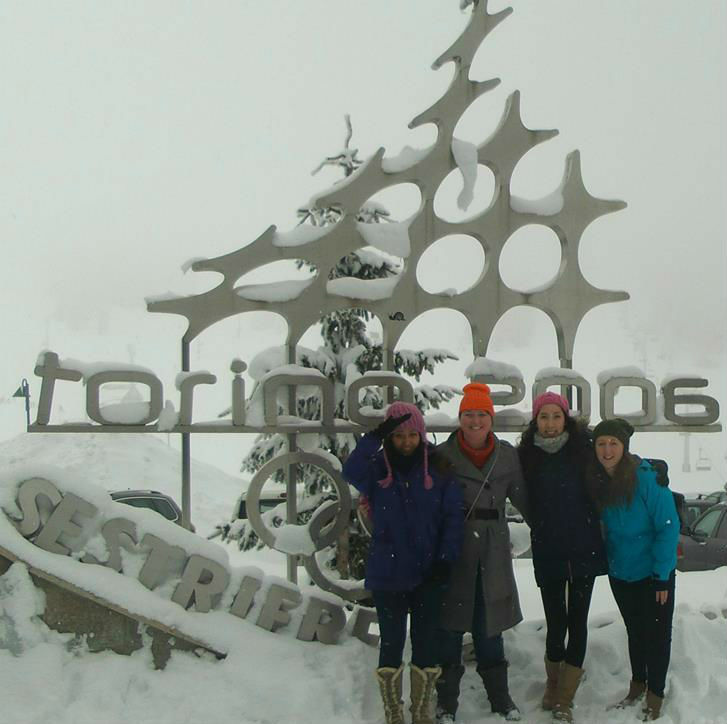 We went to the Grand Hotel Sestriere, the town where some of the downhill races of the 2006 Torino races took part. For those of you who have never been skiing here are some of the things you should know. Ski boots are the most uncomfortable shoes you will ever have to walk in. Don't kid yourself, you will have to walk in them. My tip is to dance in them instead, you might look totally crazy but your feet will thank you later. Skis are a lot heavier than you thought they would be, and you have to carry them. In our case all the way from the hotel, which was not that far but with skis felt like miles. It is perfectly acceptable for grown men to yell at women to open their legs further, provided that they are your ski instructor. In the end, I realized that skiing is super fun. While it is not something that I would go out and actively pursue myself, if given the chance again I would totally go. Oh and word to the wise, if you are staying at the Grand Hotel Sestriere, stay clear of the dining area. Everything I ate had a soapy aftertaste! Now for what you really want, pictures! Oh Mountains, I have dreams of you. Have you ever been skiing?I'd love to hear about it. Oh man, I think I did something and my comment might not have gone through! Anyway, I was saying that I did try it once a million years ago and didn't have fun at all. I really want to try snowdoarding though and I think I *AM* going to enjoy that one. Can't wait! Oh man, I always thought that I would want to snowboard as well, and the boots look 100x more comfy. Aww so sweet! I am so glad you are living your dreams back home as well! I tried indoor skying and snowboarding once. I was such a noob that I didn't think to bring anything waterproof. 11 Ways to Have a Better Day When Life Hands You Sleazeballs.